Arizona Copiers specializes in selling the highest quality copiers available, so when you buy a copier from us, you can count on receiving a machine that will provide years of service in your office. 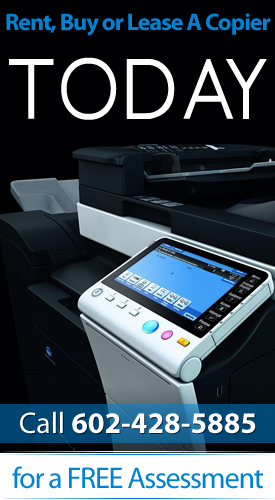 When you want to buy a copier in Arizona, we invite you to get in touch with us. Our representatives are courteous and knowledgeable, and will answer all of the important questions that come into play when you buy a copier. We make buying a copier in Arizona easy! Our services are available across the Valley of the Sun, from Glendale to Gilbert, as well as throughout other areas of the state.